We’re delighted to be working with CC Smugglers for the first time! ‘There are buskers that will make you cry, they’re so good,’ according to cult Americana artist Andrew Bird. ‘And then there are buskers that will take you to a place where sound and energy merge to create a kind of spiritual ecstasy, a joyful affirmation of life itself.’ CC Smugglers, who have made the transition from the street to the stage with consummate ease and considerable acclaim, exemplify the latter, and then some. The Bedfordshire-based band started out as ‘guerrilla buskers’, hijacking queues waiting to see other artists, or commandeering underground trains and escalators. They got their big break by playing outside every UK tour date of the two-time Grammy Award-winning Old Crow Medicine Show. Not even a severed artery on his finger could stop frontman Richie Prynne – he delayed surgery to lead the six-piece on the audacious escapade. So impressed were the Old Crow Medicine Show with a ‘hugely engaging performance’ (Sunday Times), they invited them to share their platform on the remaining dates. It was Richie who formed the band after busking alone for some years as a teenager. 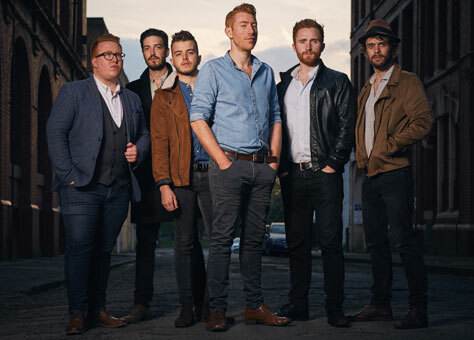 He enlisted the help of Dan Edwards (double bass), Ryan Thomas (lead guitar) and Sam Barrett (rhythm guitar and fiddle) who formed the Bedfordshire contingent of the band for several years. They were joined 18 months ago by Joplin Parnell (keys) and Joel Barford (drums) both accomplished young jazz players ‘their influences have really allowed us to explore more contemporary challenging arrangements,’ said Richie, as is evident on recent single Rhythm an irresistibly exuberant, glorious racket set to enhance their burgeoning reputation even further. Tour support comes from All Our Exes Live in Texas. All Our Exes Live in Texas is a fantasy draft of Sydney’s finest singer-songwriters – Elana Stone, Katie Wighton, Hannah Crofts and Georgia Mooney – here combining in four-part, indie-folk harmony heaven. On mandolin, ukulele, accordion and guitar, the Exes are a powerhouse of charm and songwriting prowess. Fair warning: this foursome is the most badass female folk band around. Opening the show is Mark Simpson from The Happy Soul, a melodic vocal group from Manchester. They make subversive popular music, and are better than their dwindling fanbase suggests.